Answers to your FAQ about what the heck all those acronyms mean. Maybe you've heard a little something about the A Line, or the train to the plane, as its affectionately known. It started running in 2016, and has had its fair share of troubles since then. Long story short, RTD's A Line runs from Union Station to DIA on the PTC system. Getting approval for the train from the FRA and the PUC has been tough because the PTC has bugs to work out. The problems with the A Line have turned into problems for the G Line, too. Both trains are part of RTD's Eagle P3 Project, which is run by DTP, and falls under the FasTracks plan. Got it? No? Well, let's make some sense off those letters and see if it helps. RTD: The Regional Transportation District is the public agency that provides transit in eight counties - including and around Denver - like light rail, heavy rail and buses. FRA: The Federal Railroad Administration runs under the Department of Transportation. Its mission is to implement and enforce railroad policy, regulations and safety rules for both passenger and freight trains. PUC: The Public Utilities Commission is the group of state regulators in Colorado that monitor utilities and facilities to ensure they are safe and reliable. There are more than 90 full-time employees in the agency, which is led by three commissioners. These commissioners serve four-year terms and are appointed by the governor. PTC: Positive Train Control is the operating system the A Line uses, and the G Line will use, to run. It's also the reason for the A Line's regulatory holdups. 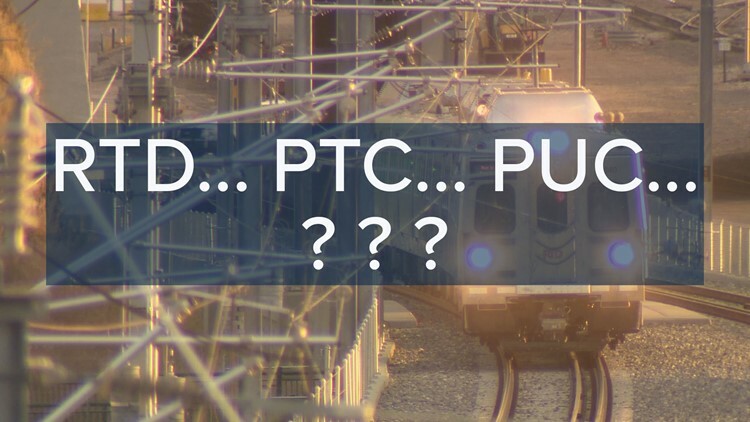 The PTC system is why the timing of the crossing gates has been inconsistent, and therefore the reason guards stand at the crossings and horns blare when the train passes (as of March 28, 2018, state regulators approved the timing of the crossing gates). The A Line uses PTC because the federal government made it a mandatory system after a train crash in California in 2008. PTC, which uses GPS technology, is meant to prevent train derailments caused by excessive speed. It can also prevent collisions, and stop trains from entering work zones where maintenance is happening. You can see a video of how it works here. All trains in the country will eventually use PTC, but the deadline has been pushed back to possibly 2020. RTD says the PTC is functioning correctly. It's the wireless interface with the crossings that's been troublesome. DTP: Denver Transit Partners is essentially a group of companies acting as one contractor, which is responsible for financing, building, operating, and maintaining a few of the rail lines (see Eagle P3 below). Their involvement is based on a public-private partnership between RTD and the Denver Transit Partnership. G Line: The G Line was supposed to start running in 2016, going from Union Station into Arvada and Wheat Ridge. Now in 2018... still no G Line because of problems with its friend, A Line. FasTracks: Voters approved a plan known as FasTracks to ramp up public transportation in 2004. Projects like the B Line, R Line, the Flatiron Flyer bus between Denver and Boulder, and the new Union Station have been completed because of FasTracks. Eagle P3 Project: Eagle P3 is a $2.2 billion project under the umbrella of FasTracks that focuses just on the A Line, the first segment of the B Line, the G Line and a maintenance facility for the trains. DTP is responsible for Eagle P3.